IIT Roorkee Notification is out. 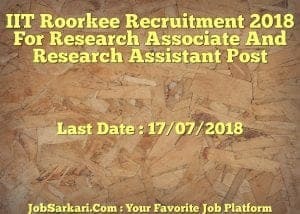 IIT Roorkee is recruiting for 02 Research Associate And Research Assistant Post Posts. You can check IIT Roorkee - Indian Institute of Technology last date, download IIT Roorkee notification, visit IIT Roorkee official website and check other IIT Roorkee Vacancy details.Complete Vacancy and recruitment Details about 02 Research Associate And Research Assistant Post vacancies in IIT Roorkee are provided below by JobSarkari.Com only for you. Research Associate. Candidate Must Have Passed MA With 55% Marks And Having NET or M.Phill or PhD. 01. Research Assistant. Candidate Must Have Passed MA With 55% Marks. 01. 2. Candidate Need to Go With Their CV. 3. Candidate Have to Attach All the Mandatory Documents Like Cast Certificate, Education Certificate, Age proof, and Passport Size Photos With CV. 4. Candidate Need to Go on Given Address For Interview on 17th July 2018. Q. 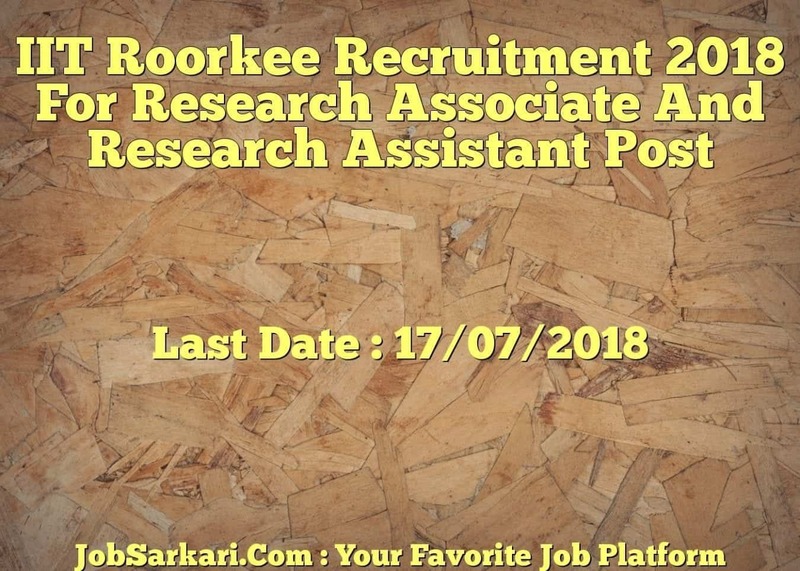 What is the Last Date For IIT Roorkee Research Associate And Research Assistant Post Vacancy ? A. Last Date for IIT Roorkee Research Associate And Research Assistant Post Posts is 17/07/2018. Q. What is the Form Type of IIT Roorkee Research Associate And Research Assistant Post Recruitment ? A. The Form Type for IIT Roorkee Research Associate And Research Assistant Post Posts is Offline. Q. How many vacancies are available in Indian Institute of Technology Research Associate And Research Assistant Post Posts ? A. There are about 0 Vacancies in Indian Institute of Technology Research Associate And Research Assistant Post Posts. Q. What is the Full Form of IIT Roorkee ? A. Full Form of IIT Roorkee is Indian Institute of Technology .